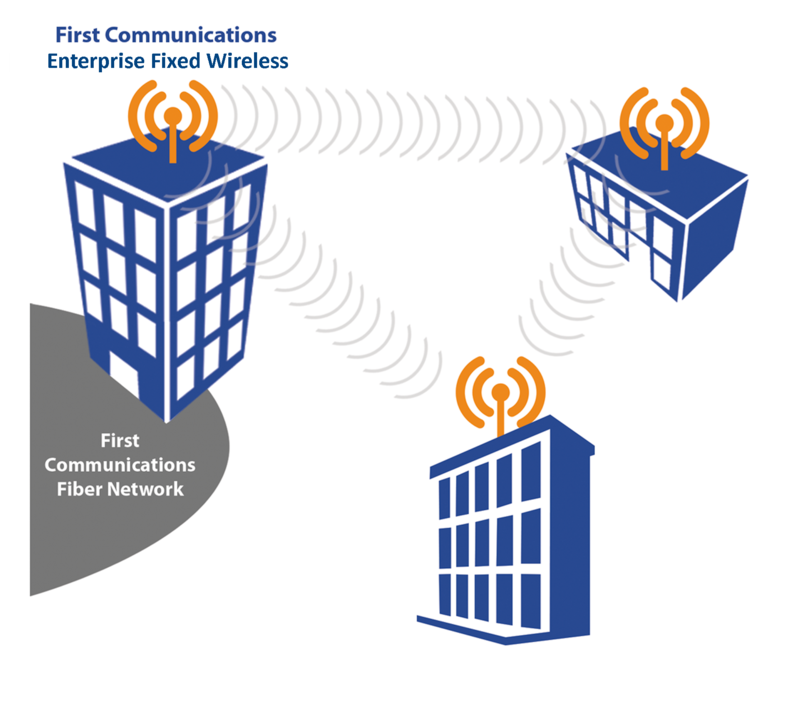 First Communications’ Enterprise Fixed Wireless provides your business with an affordable and scalable fiber network through a fixed broadband spectrum. With 100% diverse “last mile” access licensed spectrum, First Communications can support your mission critical applications quickly – with no fiber installation – by delivering high-performance connectivity. Scale your business for growth with a quick to implement solution that supports multiple network services and delivered over High Speed Broadband connections. Connected directly to the First Communications Fiber network it also meets business continuity and network redundancy requirements, complementing your existing network. First Communications’ Enterprise Fixed Wireless gives you high-bandwidth with land-based fiber is unavailable. Cloud applications need more bandwidth. We offer access speeds up to 250 Mbps. Get the bandwidth your business needs now. Typical installation is just weeks vs months. Our experienced and responsive technical experts offer five-star customer service and support. Enterprise Fixed Wireless connectivity is less expense than comparable T1 or DS3 service. Our experience and responsive technical experts offer five-star customer support whenever you need it. Available for customers that are within a 3 mile radius of the Access Point with a clear line of sight. First Communications specialist perform a path profile. Professionally installed by First Communications within weeks compared to months. Custom solutions to meet every needs of the customer. First Communications professionals are available 24x7x365 for your customer support needs. Also with hands-on technical support during regular office hours.